Branding and its application when it comes to packaging and design have been apart of M studio’s core service offerings since our firm’s inception more than 14 years ago. Understanding how to effectively apply a brand system to promotional packaging is so much more than logo application. As new and old industries alike look to design promotional packaging that both attracts and educates core consumers in competitive retail and online sales environments, telling a compelling visual story is more important than ever. Jenna Zilincar, M studio’s founder and creative director, recently talked with Forbes contributor Julie Weed about the impact strong branding and packaging can have on the emerging cannabis market. What was included as one of Zilincar’s key takeaways? Good packaging always maintains the integrity of the brand. It also must address unique challenges when it comes to safety requirements and dosing. In short, marrying creative concepts with regulatory standards are critical in an industry like the marijuana market. 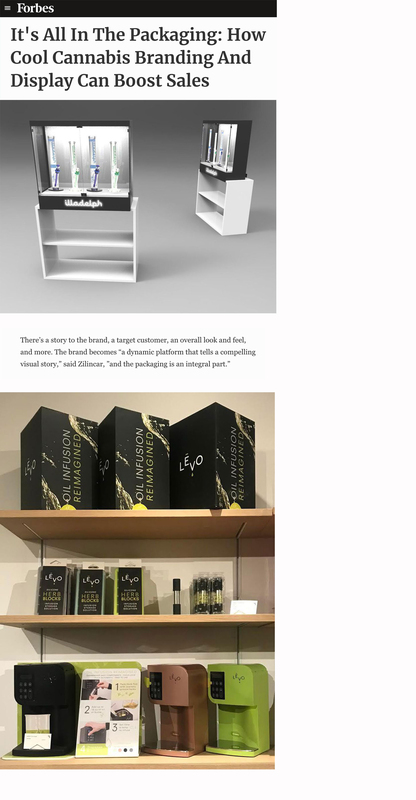 Excerpts and comments from the It’s All in the Packaging: How Cool Cannabis Branding and Display Can Boost Sales are below. You can read the full article by visiting Forbes.com.